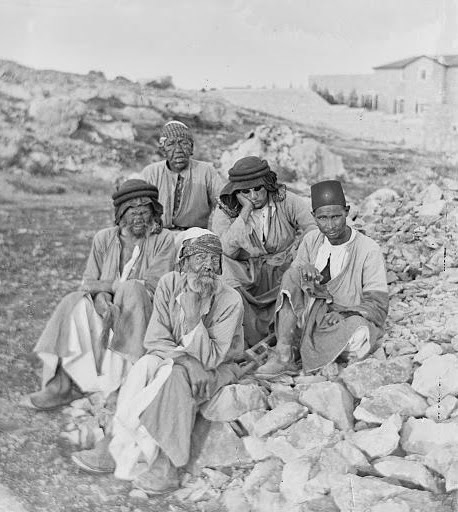 Jerusalem, (Library of Congress, circa 1900)"
Your first photo is labeled "probably" in Jerusalem. It is absolutely; it's to the west of the original Hansen compound ("Jesus Hilfe"). The patients are sitting in what we now call the western Moon Grove, and I would be very happy to show you in person where it is. That photo is probably from 1908. Secondly, I am sure you know that the "lepers" were not suffering of what was described in the Bible. Therefore, I find it important to avoid the L word and stick to "Hansen's Disease." Dr. Moshe Beer Goldgraber 1913-2007, was born in Zamosc, Poland, studied medicine in Padova, Italy, took his final exam in August 1939, went straight to a shipyard, and got on a freight ship to Palestine. Two weeks later Germany took over Poland. He lost his whole family to the Nazis. One day at the end of 1964 he went to hear a lecture at Hansen [“Lepers”] Hospital in Jerusalem. Dr. Goldgraber became involved in research and soon became the attending on-call physician (a specialist in internal medicine, among other specialties) at Hansen Hospital from 1965 until the last patients left in 2000. Beyond all that, my father, Dr. Goldgraber was the only one who took care of the Hansen Gardens from 1965-2003. I grew up living in the “small house,” built in 1893, on the hospital grounds. Beginning in 2003, I led a volunteer project to rehabilitate and restore the historic gardens of Hansen Hospital and Gardens in Jerusalem. Since 2005, I wanted to find remnants of a mule-drawn machine that appeared in this photo dated approximately 1912. The scene shows a plant nursery situated below the great rainwater collecting cistern that was built from 1898. I thought the machine might be a mill to grind something. I hoped that by unearthing it, either old seeds or grains would lead to some answers. After groping in the earth that had already become a therapeutic garden of herbs for five years, our volunteers hit the jackpot in November 2010. Seven sides of the hexagon that we sought were perfectly intact and formed a structure that was half a meter deep. But to our surprise the far side of the structure in the old photo turned out to be open. We continued to dig (northward to the farther part of the old photo, towards the cistern) and eventually reached the terrace wall. The old photo actually shows three wooden boards that are clearly visible that covered up the eighth side of the hexagon suggesting how the mule could safely walk over the channel. More digging began from the other side of the terrace wall at an outlet of the cistern itself. There, the hand carved pavement stones created a very large rectangular opening (looking like a great planter) which had filled with soil and deep rooted plants over the years. When the two tunnels finally connected the riddle was solved. This was not a mill to grind olives or oats (they grew plentifully in the historic gardens). This was a pump that drew out water and forced it into metal pipes that lead first up to the small water tank visible in the old photo just above the right corner of the cistern. Then, using mule power, the water was pushed up about five more meters and about 40 meters away into the hospital's kitchen! This was the way to supply rainwater to a vibrant and active hospital in a pre-electric and pre-water faucet era! We welcome scanned 100-year-old pictures of Eretz Yisrael from your private collections or your great-grandparents' albums.